July is rather stimulating and exciting for several reasons. The astrology this month is truly supportive of an increase in activity, creativity, and motivation. The month begins in the midst of Mercury's retrograde back track through the sign of Cancer. We're deeper in our emotions and a little less in our heads now--feeling our way through and guided by intuition. Unless Mercury touches a sensitive placement in your chart, this retrograde shouldn't be as aggravating or confusing as some other cycles since Mercury isn't passing any significant planets, so this is a more mellow time to tune in to get comfortable and intimate with ourselves. Some of us may feel the need for more "down time" which is really appropriate at this time--we may also feel compelled to make changes around our home or living space. As long as you avoid purchasing really expensive equipment or making drastic renovations, you shouldn't encounter any serious issues. Mercury Retrograde invites us to test things out, make revisions, and adjustments--but this should flow more smoothly and feel more like we're dealing with elements a little closer to home. Don't be afraid of taking action or allowing yourself to do what you need to do now--just be cautious and remain flexible because Mercury Retrograde allows us to find a different strategy; our old ways of approaching things may need to be changed or adjusted. Also be mindful that whatever you desire to push forward with may need to be corrected or may have some critical elements missing. A lot of energy has been building lately and we're reaching a crescendo as the month progresses. In fact some really significant and amazing planetary contacts are taking place this month, all of which will leave a lasting imprint and can be successfully utilized if handled properly. The majority of the energy this month is creative and emotional. Because the water element is so prominent we're drifting through subtle realms just beneath or beyond our conscious perception. We have more access to emotional depth and feelings that otherwise allude us. We can peer more deeply into realities that underpin and construct the illusory world we interact with. These realities may incite revelations and excitement, or may overwhelm us with frightening prospects. Escapism can also be a prominent theme this month, compelling us into alternate or more appealing realities. In moderation this shouldn't cause any problems, and could actually help excite our imagination. If you find yourself numbing out more than usual you may need to get clear about what you're wanting to avoid. July 1st The Sun opposes Pluto in Capricorn and then Squares Uranus in Aries on July 4th. The month kicks off with a jump start; immediately we're confronting and energizing the need for a profound metamorphosis. We begin the month on a powerful note accelerating us toward new vistas and building some muscle and strength by challenging ourselves to move past stagnation. The first few days there's a bit of intensity and if we push too hard we may come up against some resistance or opposition. Look deeper within yourself before projecting blame on outer circumstances; this will help clarify what isn't working or happening for you and why. July 6th The Moon gets sandwiched between Mars in Gemini and Jupiter in Cancer which could generate enthusiasm and motivation--or anger, frustration, and anxiety. This is best channeled inwardly and intimately. Funnel this energy around the house--look for projects that you've already started or put into motion and have at it, things could go in unexpected directions. The collective vibe could stir up hostility with certain people, so be on the look out and try your best to avoid sensitive material so as to not push any particular buttons. July 7th Venus trines Uranus and Saturn goes stationary direct--creativity and unique self expression gets energized; forge new frontiers fueled by the passion of the heart. Saturn turning direct means that we have more structural support and backing in our endeavors. Since Saturn turned retrograde on February 18th we've had a chance to process and digest a lot of deep and uncomfortable material--like that stuff we usually don't enjoy looking at or experiencing. We also got a chance to catch up and put ourselves back in alignment with personal responsibilities. We can start to get a little more serious now because with Saturn direct we're not just practicing anymore, we're doing the real thing. Conquering the depths certainly isn't easy, but if we're focused and determined and ready to put in the hard work, valuable rewards await. July 8th The New Moon occurs at 16 degrees of Cancer--Nostalgia, daydreaming, and self reflection are key elements of the new lunation cycle. Creative brainstorming gets a boost as well as the opportunity to rework visions that we've put aside or thought were long gone and impossible to solidify. Stretch the limits of your perception and go within to find what really matters to you the most. Idealism is strong and there's nothing wrong with it as long as we realize that the ideal is only a rough template we use to make our own design. July 9th The Sun conjoins Mercury Retrograde igniting an entirely new process that will develop over the next three months until the next Mercury Retrograde cycle. What begins now is likely a rehash of past unresolved material and we get to see through to tying up all the loose ends. This could deal with past projects or specific relationships. This cycle allows us to cross into familiar territory with a renewed vision and perception. This also brings us into the more "constructive" phase of the Mercury retrograde cycle where we can begin putting things back together since we've pin pointed all the weak spots. July 13th Mars enters Cancer--Now that Mars is in Cancer the emotional and imaginal realms are more empowered. We may feel a tidal wave of emotions encircling us allowing for the expression of deeper material we've been holding back or that we've been avoiding. As Mars approaches Jupiter there's a rising impetus to take action or to resolve situations from the past--to change the way we handle certain experiences. Leading up to the Full Moon on July 22nd we begin a process that can assist in rewiring our brains by imprinting or recording new approaches to experiences we've previously encountered. There could be a lot of confusion with these energies because a part of us may feel the need to take action "out there", but in reality this is all pointing us internally, to how outer experiences imprint themselves upon our subjective inner world. Look for experiences that are comprised of a rehash of familiar material and how you can adjust your attitude towards it. This is a rather significant day correlating to an interesting configuration. We've been feeling a lot of energy building, which will continue to do so, but this day marks a significant crescendo as Jupiter brings a water grand trine into sharper focus. The emotional and intuitive realms take center stage infusing the collective with an emphasis on subtle dimensions. Psychic channels amplify leading to an increase in insight, imagination, or an exaggerated idealism. Go with the flow but maintain conscious control so that you don't get swept up and lose all sense of direction. Also be weary of falling into stagnation because grand trines tend to entice us to settle with what is and then nothing gets done; make use of your insights and perceptions. Discern from what's authentic and what's just overstated sensationalism. Dream activity has likely increased for many of us and the days surrounding this date will correlate to some significant insights and shifts from the unconscious. With Mercury Retrograde in opposition to Pluto and forming a grand trine with Chiron and the North Node in Scorpio, we may also find ourselves amidst some deep karmic experiences and situations. We're dealing with a lot of unresolved material that could have prominence in the form of dynamic dream symbolism and outer events involving specific people. In addition Uranus turns stationary retrograde--Collectively we've been radically defining ourselves in entirely new ways, forging into places we normally fear to tread. Naturally, we've encountered some resistance along the way, especially with authority figures that would rather maintain the status quo--our actions may be threatening to their overall security. As Uranus turns retrograde we get a chance to process and digest all the head-way we've made so far. That means settling in and adjusting to the new landscape we fell into as we danced off that precipice. Uranus Retrograde helps to strengthen our new image by adding some more unique twists and alternations. We'll find ourselves feeling less pioneering and more focused on the trail we previously blazed until December when Uranus turns direct. 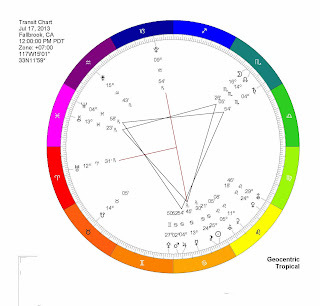 July 20th Mercury turns stationary direct and Mars forms a grand trine with Neptune and Saturn--With Mercury stationary direct we're slowly reverting the energy into forward motion after having been more internally focused and directed. We slowly transition from extreme subjectivity to a more confident forward flow. Mars, Neptune, and Saturn form an exact water grand trine giving us confidence and impetus to implement all that stuff we've been formulating and constructing in the ethers. What may have seemed impossible, abstract, or less accessible now has the potential for more concreteness and solidification. We may additionally find ourselves feeling more certain and clear about what exactly we desire to put into motion--and at this point, if it feels right, do it! July 22nd The Full Moon occurs in the tropical sign of Aquarius, Mars conjoins Jupiter, Venus enters Virgo, and the Sun enters Leo--This Full Moon generates a lot of momentum, passion, and enthusiasm since Mercury turned direct two days ago and Mars and Jupiter team up in Cancer. We've had the chance to explore our emotions quite a bit and to straighten out some rough edges in our psyche. Forward motion and direct action is favored since now we find ourselves back in the driver's seat along with a surge of confidence. Hopefully, if we've done the work, then we're ready to let everything fall into place but we have to take the reins ourselves. That means we need to put forth effort to make anything happen. Trust what unfolds, push yourself, but don't push too hard. Know your limits and boundaries. July 26th Venus opposes Neptune--They say that both God and the Devil are in the details--so if you're going to do it, do it well. Don't get caught up chasing illusions, try your best to discern what's really valuable and what's just a mirage. Just when you think you've got it all pinned down and everything is accounted for, things start drifting into some alternate dimension. Enhanced receptivity opens the potential for truly "higher" insight and awareness; if you can't figure out what to do with it, just consider it and take in the experience. July 27th Mars opposes Pluto-- If something isn't moving in the direction you're wanting or if there's some external resistance to your efforts see where you can compromise and lay off a bit. Pushing too aggressively might not work out too well, but then again, doing nothing may generate a bit of frustration. We might find ourselves feeling a lot more aggressive in pursuit of a desire to establish or protect our security. Do what you feel is absolutely necessary and simply let things fall into place in their own timing. July 29th Grand Sextile (Star of David)--The month ends with a strikingly powerful configuration of planets. The abundance of sextiles and trines incite an influx of highly creative and visionary energy. A powerful conduit is created that infuses the collective mind with a catalytic force that excites water and earth signs primarily (Taurus, Cancer, Virgo, Scorpio, Capricorn, Pisces--as well as Aries). This has a crystallizing effect, in that it allows a lot of disparate elements to come together in harmonic accord and integrate into some kind of physical formation. This massive closed circuit of energy gets channeled directly into Uranus in Aries forming a T-square with Jupiter and Pluto. This incites the power of the individual to be a creative conduit of transformation. This is an incredibly harmonizing and balancing energy field--and the preponderance of feminine/yin signs means that we must remain mostly receptive in order for this energy to permeate us individually. This has the potential to bring a lot of differing elements together. Towards the end of the month see how you can harness this energy to become a creative catalyst of change. Many themes and issues presented at this time will develop and carry through to next Spring when Jupiter, Uranus, and Pluto meet up again. In conclusion, the month of July is truly extraordinary and has the potential to set a lot into motion. The end of the month is far more conducive for more aggressive forward action, since Mercury Retrograde has us in a state of reflection and reassessment. The configurations this month invite us inwardly to understand that there really is very little difference between our inner and outer landscapes. That means we're likely to see a lot of connections and synchronicity. We have the opportunity to notice that transcendent realities can be experienced in our common day-to-day routines--that life as we experience it is truly symbolic of something far more complex. What is your reality saying to you? Pay attention, there will be signs and signals all around you. Have fun with this; flow with it and allow yourself to be guided by your feelings, hunches, and intuitive insights. It's truly rare that the universe opens itself up like this, allowing us a deeper understanding of the inner workings of the cosmos. Realities are merging, fusing, and coalescing--and while the veils are thin get a glimpse of all you can.